This article originally appeared in Issue 5 of Crawdaddy in Sept. 1966. The Byrds have been personal favorites of mine since “Mr. Tambourine Man.” Their sonorous and overpowering (though technically simple) backgrounds have a way of just pulling the listener along. The more you listen to them, the more you realize there is to what they’re doing. Unfortunately, they recently lost vocalist Gene Clark, who has gone on to organize Gene Clark and the Group, and the new album suffers greatly from this loss. Gene, whose lead vocals in the past included “Feel a Whole Lot Better” and “Set You Free,” was by far the best writer in the group, and although leader Jim McGuinn usually sang lead, Gene clearly had the best voice. 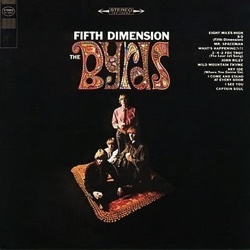 As a result of Clark’s departure, Fifth Dimension has a sound quite different from previous Byrds records. (The album includes only one song with Gene—”Eight Miles High.”) For the first time, vocal solos are emphasized and, also a first, the instrumental patterns are varied, more so than in the past. “I See You” is a so-so uptempo tune and features the famous Byrds “raga-rock” (a term McGuinn jokingly coined himself). I find the intrusion of the Eastern sound into a totally Western melody more an annoyance than anything else, both on this cut and especially on “What’s Happening.” The latter is a beautiful song by Dave Crosby but could have been done far more effectively without Indian-sounding instrumental breaks after each verse. The vocal, which is either by Crosby or McGuinn, is one of the best on the LP. “Eight Miles High” (a song about a jet plane trip to London, according to McGuinn) is a fine tune, especially instrumentally (a pat on the back to Mike Clarke). In addition it is the only cut on which the sitar is used effectively in a Western melody. “Hey Joe” proves that McGuinn can really play the guitar, while “Captain Soul” should have stayed on the flip side of the “5D” single. “2-4-2 Fox Trot” is a throwaway cut. The jet sounds in the background simply do not come off. That leaves us with three genuinely unusual cuts on the album. “John Riley” was a good idea; it is, of course, a really beautiful ballad. However, the vocal lead is simply not strong enough to put it over. Clark is particularly missed here. This same comment pertains to but is less true of another folk ballad, “Wild Mountain Thyme.” The violins on both cuts are too loud, if they aren’t out of place altogether. The best cut on the album for my money is Nazim Hikmet’s “l Come and Stand at Every Door,” a direct protest against the dropping of the Hiroshima bomb, a number which the Byrds do superbly. The harmony on the last chorus is perfect, and Clarke’s toned-down drumming is in fine taste. This album, then, cannot be considered up to the standards set by the Byrds’ first two, and basically demonstrates that they should be thinking in terms of replacing Gene Clark, instead of just trying to carry on without him.